Paula Principles are strategies that I have found over the years to be foundational building blocks to changing your body, transforming your health, and improving your life. 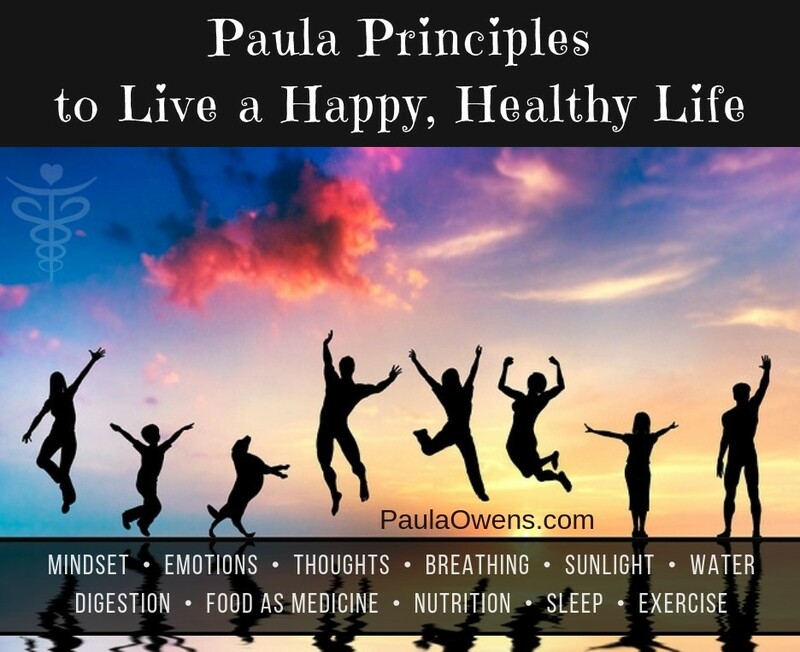 You will move closer to living a happy, healthy, disease-free life when the Paula Principles are put into practice as your lifestyle medicine. Many of these Paula Principles have been taken from my books, The Power of 4 and Fat Loss Revolution. All too often, so many people are looking for the next quick-fix, they become hyper-focused on the latest celebrity diet, biochemical pathways, their genetics report, a specific SNP, or any flavor of the month club fads online, yet they do not have the basic Paula Principles as a foundational component to their health and lifestyle. It always comes back to the Paula Principles! Clean water. A general rule of thumb is to drink half your body weight in ounces of water every day (away from mealtime). For example, a 150lb person would drink about 75 ounces a day. You can tell that you’re well hydrated when your urine is a light-yellow color. Install a water filter in your kitchen and shower to minimize exposure to heavy metals, fluoride, chlorine and other harmful chemicals. If you’re drinking reverse osmosis water, change the filters annually; and, add a pinch of Celtic sea salt for additional minerals. Clean air. Although we don’t have much control over the outdoor air, there’s plenty we can do to monitor the air quality inside our home. Change air filters monthly. Service your HVAC unit periodically. Clean the air ducts. Open the windows for 20 minutes every day. Fill your home and workspace with live house plants. Spider plant, dracaena, garden mum, and peace lily are all great indoor plants that purify indoor air. Let food be your medicine! Organic, in-season, locally-grown, non-GMO, grass-fed foods are the best options. Eat more plants! Reduce inflammation and risk of disease with a wide diversity of antioxidant-rich leafy greens, vegetables, herbs and spices. Animal protein must be grass-fed, pasture-raised, free-range and organic. Eat only wild seafood. Ditch the inflammatory, ultra-processed, neurotoxic foods. You can’t be healthy if you eat toxic chemicals and processed frankenfoods. Eating foods treated with glyphosate, toxic chemicals, pesticides, fertilizers, poisons, GMOs, antibiotics, and growth hormones are a major cause of neurotoxicity and disease in the world today. Choose a diversity of organic, low-toxin, low inflammatory, nutrient-dense foods. Mealtime mindfulness. Portion control. Chewing. Gratitude. Avoid grazing, nibbling or snacking throughout the day. Home Cookin’ is where it’s at! Cook and prepare the majority of your meals at home using real food and fresh ingredients. Cooking skills used to be passed down from generation to generation, but this trend has been broken and now millions of people lack basic cooking skills. Replace nonstick pans with glass or ceramic cookware. Good sleep is nature’s best anti-aging antidote. Sleep is crucial for longevity, weight loss, emotional stability, balanced hormones, repair and detoxification. Your brain does the majority of its detoxification at night while you’re asleep. Melatonin (the sleep hormone) is the most important hormone for healing and nourishing the body and the brain. Sunlight is an essential nutrient. Sunlight plays a vital role in immunity, cardiovascular health, good sleep, and regulating hormones, hunger, mood and metabolism. Our brains need light at the correct time of the day to set our biologic body clock and circadian rhythm. Just 20-30 minutes of daily sunlight☀️ has so many healing properties and significant health benefits: fights depression, strengthens immunity, improves sleep, lowers blood pressure, reduces risk of heart attack, stroke, autoimmune and cancer, balances hormones, happier mood, stronger bones, and even prolongs life. Mindful breathing is an overlooked component in mind-body health. Practice mindful breathing throughout the day. You’ll notice a huge shift in your energy, sleep, mood and clarity. Soul food. Develop a relationship with God, Jesus, a Higher Power and your spirit. Spiritual vitamins such as repetitive prayer, a mantra or an affirmation, meditation, gratitude or studying the Word shift the autonomic nervous system, discipline the mind, and nourish the soul (your mind, will and emotions). Gut restoration: absorption, assimilation and elimination. A healthy gut = a healthy person. Your gut has more neurons than your brain, and anything that affects the gut affects the brain. 80% of the immune system resides in the gut. 90% of serotonin and other neurotransmitters are made in the digestive tract. Daily bowel movements, maintain integrity of the gut wall, eradicate problematic infections, support digestion and a healthy microbiome. Birds of a feather. You become like the people you spend the most time with. Who’s in your close circle? Our inner circle affects what we eat, how we think, our mindset, attitude, weight, microbiome, our income, gene expression and so much more. Cultivate relationships with like-minded people who support, encourage and respect you. Seek out those who value their health and live a healthy lifestyle in mind and body. Oral Microbiome. The health of your mouth, teeth and gums affects your brain, heart and entire body. Avoid mercury amalgams. Environmental toxins. Laundry detergents, fabric softeners, dryer sheets. Colognes, perfumes and skin care products. Deodorants. Non-stick cookware. Plastics. Bug and pest control products. Cleaning supplies. New flooring, carpet, mattresses, furniture. Many of these items contain poisonous chemicals that are harmful to our health, our pets, wildlife, and the environment. It’s the accumulative load and overwhelming burden that causes damage. Electromagnetic fields cause damage. Pesticides cause damage. Vaccines cause damage. Pollution causes damage. Plastics cause damage. Awareness is key. On your skin, in your body. Many lotions, moisturizers, soaps (dish, laundry, shower, bath), cologne/perfumes, cosmetics, shampoo, fabric softeners, dryer sheets, hand sanitizers, tattoos, and sunscreens contain harmful chemicals that mimic hormones, disrupt the thyroid and entire hormone system, block your body’s natural ability to produce vitamin D, and can cause many other problems such as immune dysregulation, skin irritation, allergies, skin cancer growth, skin damage and more! Leave the toxic chemicals on the store shelf! With just a few simple, you can DIY and make your own chemical-free, non-toxic hair, skin and body products, and household cleaners. Digital detox. Although technology can be great, we all need to wake up to the dark side and negative impact that electrosmog, dirty electricity, EMFs, EMRs, 4G, 5G, screen time and smartphone addiction has on our mental, emotional, relational, mitochondrial, cognitive, and physical health. Study after study tells us that television, smartphones, tablets and other electronic devices are bad for our health. Studies show that they make us less productive, more anxious, agitated, and less happy. Set a goal to unplug earlier. At least one night a week and one full day on the weekend: No email. No texting. No social media. Say no to drugs. OTC and Rx drugs rob your body of vital nutrients that are essential for your brain and body. Whether it’s the birth control pill, diabetic, cholesterol-lowering statin drugs, antibiotics, hypertensive or reflux medication, all drugs have side effects that are detrimental to our brain and body. There isn’t any drug on the market that can come close to the power of a healthy lifestyle in preventing disease and improving the quality of your life. Avoid medications that induce unfavorable changes in lipids, blood pressure, insulin sensitivity, glucose, weight, hormones, GI function, mood, and come with many other risk factors. Be active. Find an activity that you enjoy and do it! Move your body every day to improve mood, mitochondrial health, brain function and energy. Prevent sarcopenia (age-related muscle loss) and dynapenia (age-related strength loss), increase metabolism, improve posture, and accelerate fat oxidation. Exercise is the most underutilized natural antidepressant and natural anti-aging therapy. Vitamin N. A daily dose of nature therapy (without a phone). Spending time in nature is a natural, drug-free, healing remedy that will re-set your biological body clock, reduce anxiety, and whatever ails your soul. Declutter. Clutter is not just physical stuff. It’s old ideas, toxic relationships, and bad habits. Clutter is anything that does not support your better self. Bio-individualized nutrients to balance your body chemistry, correct deficiencies, and improve cellular health. Nutritional deficiencies cause a laundry list of symptoms that lead to conditions that are often addressed with drugs (band-aid medicine). A deficiency of any single nutrient can cause hormone imbalances, affect sleep quality, mood, memory, metabolism, immunity, energy and focus, and the appearance of your hair, skin and nails. Nutritional supplements work best only when the other Paula Principles are being utilized. Annual blood work is one of the smartest investments in your health to detect what’s going on at the cellular level. A functional blood chemistry analysis can provide valuable insight into your unique nutrient status to balance your body chemistry. Gratitude Attitude. Upon rising and again before bedtime recall things, people and places that you’re thankful for. Make a list of 10 different things that you’re grateful for every day. Doing so shifts your energy immediately You’ll feel better and less stressed. Focus on positive outcomes and desired actions. Positive emotional states are linked to prolonged life expectancy. So, expect the best! Gratitude has a profound impact on gene expression and triggers release of antidepressant chemicals, improves emotional resiliency, and lowers inflammatory cytokines all of which helps combat stress and depression. Gratitude improves heart health, sleep, immune function, and reduces pain and inflammation! How many Paula principles are true for you?